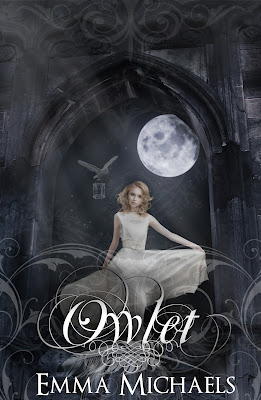 Today I have a review I wrote for the Owlet by Emma Michaels blog tour, put together by Tribute Books. Along with my review you get to take a peak inside this new book by reading an excerpt on my blog today. If you are intrigued don't miss out on entering the giveaway. 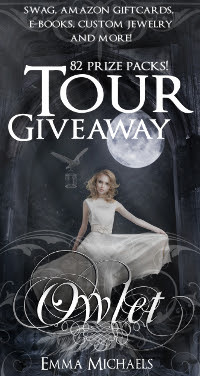 This blog tour is also a read along so if you want to find more excerpts check out the blog link list at the end of this post. I hope you all enjoy this post. Thank you all for stopping by and thank you Tribute Books for having me on this blog tour and giving me a chance to read Owlet. “If the feathers are white then that must mean...” Falcon could hardly take his eyes off Iris now. He searched for something about her that might tell him more; something that might answer the questions forming in his mind. Why would the Eyrie ask me to kill a White Owlet, when white can only ever mean she is driven by truth? Iris lived a sheltered life because of her severe asthma. When she slept she would have a recurring dream of flying to a beautiful island, little did she know that it was a real place. Iris had lost the memory of her childhood of when she lived on the island. Now she was going to the island again and she would begin to learn the truth about her life, and her forgotten memories. Owlet was a nice introduction to the world of the society of feathers. I got to uncover the secrets and truth about Iris’s past as she did. I learned about Iris and the world that she will be getting to know more in future books. This book had a slower feel to it and I wanted more excitement but I think that is just because it was an introduction to the story and world type of book and I respect that. It is nice knowing the history and how the characters got to where they are. I had a difficult time getting used to the author’s writing style, the points of views and perspectives shifted and caught me off guard, but over time I got used to it and was still able to enjoy the story. I found the world interesting and compelling. I like the idea of the world and the relationships between the characters and would like to see them unfold even more. I look forward to reading the next chapter in Iris’s journey. I think the story’s pace will pick up more as the story unfolds and I can see myself liking the next one even more. I’m interested in reading the next installment in this series and finding out what happens next with Iris and her world. I received Owlet from Tribute Books for review. Christie, thanks for taking part in the read-along. We appreciate your support of Emma's new YA series and for introducing it to your blog followers. Thanks for helping us spread the word!